The Full Court of the Federal Court has revisited on appeal Perram J’s decision in Informax from which is drawn the exquisitely evocative restraint of trade expression recorded above – an expression perhaps more amenable to a course of antibiotics rather than injunctive relief. Although the Full Court largely upheld Perram J’s findings, primarily under challenge was the trial judge’s reasoning that s 16(4) of the Independent Contractors Act 2006 (Cth) (IC Act) did not permit the variation of a contract, found to be unfair or harsh, with operative effect from a date which predates the making of the court’s order. 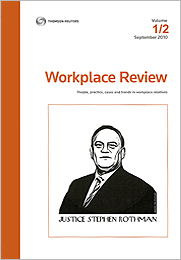 Commentary on Perram J’s view of the Act has suggested the Act was a “Paper Tiger” (see (2011) 2 WR 152). Further, as s 16(4) states that orders “may only be prospective in operation”, this does not mean that such orders may not have remedial effect on events or transactions which predate the date upon which an order is made (at ). Accordingly, it was open to the court to make a remedial order dating back to the contract’s formation but operative from the date of the court’s order (at ). Also, it may be relevant to consider how the contract operated between its formation and any orders being made, as such evidence may shed light on its potential to operate unfairly (at ). The Full Court was critical of the applicants’ pleadings as not accurately relying upon the power found within the IC Act’s scheme. Yet in the unique circumstances of the case, and consistent with the Full Court’s interpretation of the purpose of the Act, it permitted the applicants to amend their notice of motion to claim an order which is within the court’s power to make (at ). If that amendment is successful, the matter is to be remitted back to the primary judge for re-determination. Unfair contracts will probably never reach the dizzy heights of the largely defunct New South Wales s 106 jurisdiction but the Full Court has given the Paper Tiger some teeth. Citation: (2012) 3 WR 182.